او تند غذا می خورد. Have you eaten all the chocolates? What time shall we eat? We don't eat out very often. Felix chatted cheerfully as he ate. A small girl was eating an ice cream. We had plenty to eat and drink. It’s important to eat healthily when you are pregnant. I exercise and eat right and get plenty of sleep. We stopped at McDonalds to get a bite to eat. Good eating habits are the best way of preventing infection. No chicken for me. I don’t eat meat (=I never eat meat). Let’s eat first and then go to a movie. We could not afford to eat at Walker’s very often. I’m going to make you eat your words. That’s a great drawing. Pablo Picasso eat your heart out! If you had any sense you’d forget him, but eat your heart out if you want to. You can’t tell him that – he’ll eat you alive! If the Democrats win the election, I’ll eat my hat! He soon had the client eating out of his hand. ▪ eat breakfast/lunch/dinner etc What time do you usually eat lunch? ▪ eat well (=have enough food, or have good food) The people work hard, but they eat well. ▪ eat healthily/sensibly (=eat food that will keep you healthy) If you eat healthily and exercise regularly, you’ll look and feel a lot better. ▪ eat properly British English, eat right American English (=eat food that will keep you healthy) He hadn’t been eating properly and was drinking far too much. ▪ eat hungrily (=eat a lot quickly, because you are very hungry) The children ate hungrily, devouring everything on their plate. ▪ eat sparingly (=eat very little) Carter joined us for lunch, but ate sparingly, as he always did. ▪ have something/nothing to eat (=eat something/nothing) We’ll leave after we’ve had something to eat. ▪ have enough/plenty etc to eat Have you had enough to eat? ▪ have little to eat (=not have enough food) The refugees had very little to eat and no clean water. ▪ find something to eat I got dressed and went downstairs to find something to eat. ▪ get something to eat (=prepare or buy some food) I’m sure you can get something to eat on the train. ▪ sb’s eating habits (=the kinds of things they eat or drink regularly) The doctor asked me about my eating habits and how much I smoked. ▪ an eating disorder (=a mental illness which causes you to eat too much or too little) She described her battle with the eating disorder bulimia. ▪ a bite to eat (=a small meal) We should have time for a bite to eat before we set out. ▪ eat like a horse (=eat a lot) She eats like a horse but never puts on any weight! ▪ eat like a bird (=eat very little) Ever since she was a child, Jan had always eaten like a bird. ▪ I couldn’t eat another thing spoken (=used to say that you are completely full) Thanks, that was lovely, but I couldn’t eat another thing. 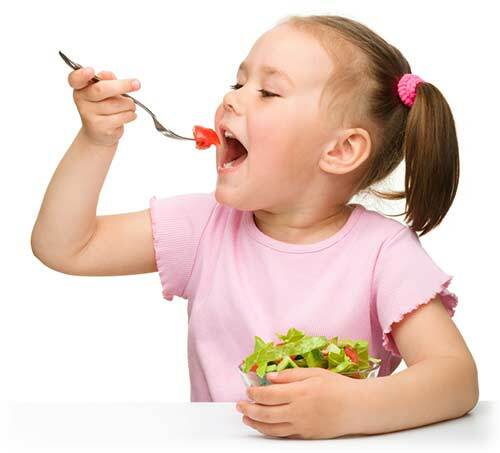 ▪ eat to put food in your mouth and chew and swallow it: Experts recommend eating plenty of fruit and vegetables. ▪ have to eat a particular food: ‘What do you usually have for breakfast?’ ‘I usually just have coffee and toast.’ | We had the set meal. ▪ feed on something to eat a particular kind of food – used when talking about animals: Foxes feed on a wide range of foods including mice, birds, insects, and fruit. ▪ consume written to eat or drink something – used especially in scientific or technical contexts: Babies consume large amounts relative to their body weight. ▪ munch (on) something to eat something with big continuous movements of your mouth, especially when you are enjoying your food: He was munching on an apple. | They were sitting on a bench munching their sandwiches. ▪ nibble (on) something to eat something by biting off very small pieces: If you want a healthy snack, why not just nibble on a carrot? ▪ pick at something to eat only a small amount of your food because you are not hungry or do not like the food: Lisa was so upset that she could only pick at her food. ▪ stuff/gorge yourself to eat so much food that you cannot eat anything else: He’s always stuffing himself with cakes. | We gorged ourselves on my mother’s delicious apple tart. ▪ slurp to eat soup, ↑noodles etc with a noisy sucking sound: In England it’s considered rude to slurp your soup, but in some countries it’s seen as a sign of enjoyment. ▪ gobble something up/down informal to eat something very quickly, especially because you like it very much or you are greedy: You’ve gobbled up all the ice-cream! | The children gobbled it down in no time. ▪ wolf something down informal to eat food quickly, especially because you are very hungry or in a hurry: The boy wolfed down everything on his plate and asked for more. ▪ bolt something down British English to eat food very quickly, especially because you are in a hurry: He bolted down his breakfast and was out of the door within 5 minutes. | You shouldn’t bolt your food down like that. ▪ devour /dɪˈvaʊə $ -ˈvaʊr/ especially written to eat all of something quickly because you are very hungry: In a very short time, the snake had devoured the whole animal. ▪ be on a diet to be eating less or different food than normal in order to become thinner: No cake thanks – I’m on a diet. ▪ fast to not eat for a period of time, often for religious reasons: Muslim people fast during the month of Ramadan. The stones are being eaten away by pollution. His gambling was eating away at their income. The thought of mother alone like that was eating away at her. John’s university fees have been eating into our savings. Come on, eat up, there’s a good girl. She’s made a cake and wants us to help eat it up. Big cars just eat up money. • I was too nervous to eat. • She doesn't eat sensibly (= doesn't eat food that is good for her). • ~ sth I don't eat meat. • Would you like something to eat? • I couldn't eat another thing (= I have had enough food). • Where shall we eat tonight? • We ate at a pizzeria in town. more at have your cake and eat it (too) at cake n., (a case of) dog eat dog at dog n.
Idioms: I could eat a horse ▪ I'll eat my hat ▪ eat humble pie ▪ eat like a horse ▪ eat out of your hand ▪ eat somebody alive ▪ eat somebody out of house and home ▪ eat your heart out ▪ eat your heart out! ▪ eat your words ▪ eat, drink and be merry ▪ what's eating him, etc? Old English etan, of Germanic origin; related to Dutch eten and German essen, from an Indo-European root shared by Latin edere and Greek edein. • We ate at the new restaurant in town. • Barton did not feel very hungry and ate sparingly. • Come on, eat up your lunch. • Do you have anything to eat? • Do you want to grab a bite to eat? • Everyone happily ate the huge meal. • Go and get yourself something to eat and drink. • He had not eaten properly for days. • He'd barely eaten any breakfast. • He's eating us out of house and home. • He's not eating enough. • I'm trying to eat more healthily. • She doesn't eat sensibly. • She's very thin but she eats like a horse! • Try and eat something. It will do you good. • We ate very well most of the time. • We eventually sat down to eat at 8.30 p.m.
• We went out to eat for a Chinese New Year celebration. • You look good enough to eat! • I can't be bothered to cook. Shall we eat out tonight? • I couldn't eat another thing. • I don't eat meat. • You can eat really well without spending a fortune. When I've got a cold, I don't feel like eating. We usually eat (= have a meal) at about 7 o'clock. We met in a little eatery just off the main road. Would you like some eats? When you eat something, you put it into your mouth, chew it, and swallow it. We took our time and ate slowly. If you eat sensibly or healthily, you eat food that is good for you. If you eat, you have a meal. ‘What the hell’s eating you?’ he demanded. If you have someone eating out of your hand, they are completely under your control.